If you’re looking for clues to the dizzying imagery of Tim Spelios’s collages, you’re not going to get very far. Visit his website, and you’ll find a portfolio and a resume and not much else. And the press release for Before Disembarking, his current show at Studio 10 in Bushwick, offers not a background text but a poem written by the artist. More than 100 years ago, in their Cubist heyday, Picasso and Braque introduced bits of newspaper, wallpaper, and other ephemera into their work as a way of anchoring it to a reality they were otherwise busily shredding. Since then the universe of collage has expanded exponentially, primarily in the arena of disjunction — the abrupt shifts of context and scale that became synonymous with much Surrealist and Dadaist art. Whether it is employed in a Cubist mode, where the pasted-in elements represent themselves alone, or on the fractured plane pioneered by Max Ernst and Hannah Höch, the presence of collage has a way of making the art object realer than real (the literal meaning of Surrealism), and its dual legacy has proven a potent tonic for art-making ever since, with contemporaries such as Mark Bradford falling into the former camp, and Wangechi Mutu into the latter. Tim Spelios’s unruly deviation from this lineage is certainly among the reasons why his collages are so beguiling. They are made entirely out of cut-up photographs, and they retain the fine-grain, grisaille sheen of vintage advertising layouts, yet all we see at first glance is a kaleidoscope of abstract swooshes, swipes and voids. Such incongruence between a source and its manipulation throws a monkey wrench into the workings of our visual receptors, which are conditioned to respond one way to a specific cluster of stimuli (the tonal gradations distinct to photography) and in a very different way to another (the propulsive currents of gestural abstraction). The continuity we expect from a photograph’s content, surface, and structure is dashed, and the resulting shards, culled from magazines and cut into undulating jigsaw shapes, now skate along the edge of chaos. 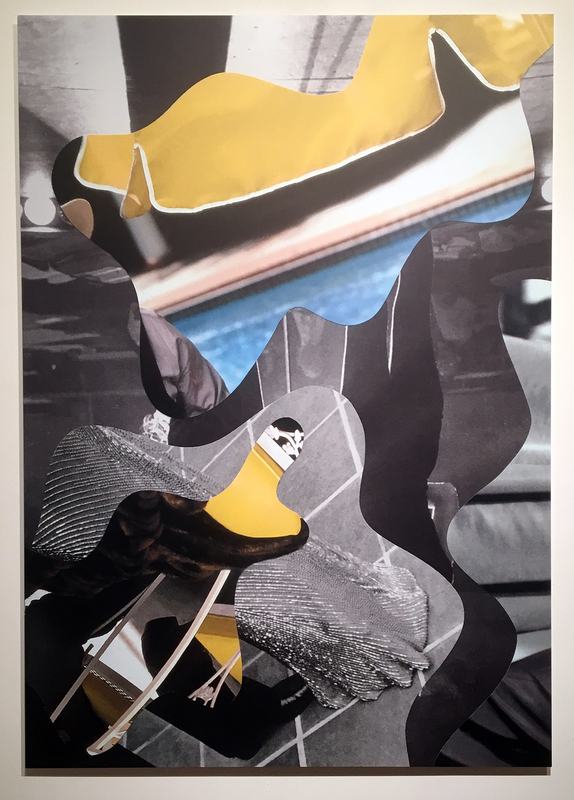 A compounding factor of Before Disembarking is that the works on display are not collages at all, but unique UV prints on aluminum sheets that have been digitally transferred from Spelios’s original paper compositions. This adds an extra layer of alienation from the photographic sources, as well as an accentuation of the painterly qualities of the surface, which catches the ambient light differently depending on the distribution of ink — dense here, sparse there, with occasional patches of white ground peeking through. The occasional shots of acidic color popping out of the grayscale range of the black-and-white photos — red, pink, pale blue, green, and yellow — add another destabilizing factor to the mix. But then, with his titles, Spelios cuts through the layers of intended and/or unintended ambiguity and zeroes in on a concrete descriptor or detail, such as “Pool” or “Pink Hat” or “Preening” (all 2016). After sending us down a rabbit hole of swirls, streaks, and fragments, he yanks us back up with some small, identifiable chunk of the real world, which subsequently unspools across the totality of the work to leave us, if not reassured (and we’re not — the amoeba-like shapes filled with dislocated imagery remain fractious if not frightening), then at least feeling some measure of control over what we’re looking at. In addition to his strengths as an artist, Spelios is an accomplished drummer — a former member of the No Wave noise band, The Chairs, he now holds a series of performances at Studio 10 called Endless Broken Time in collaboration with the artist Matt Freedman, who tells stories while simultaneously illustrating them in charcoal and newsprint. In his visual work, Spelios transfers the percussionist’s skill of spellbinding audiences with a tightly wrought rhythm (the sinuous amoeba patterns wending across the surface), while keeping them off-balance and on edge (the lunges of color and illegible imagery), never knowing when to expect the next crash or thwack. The transitory nature of improvised music gives us little to hang onto, experienced in the moment and held in the memory, or not, as a blip in the sensory field. In much the same way, the newspaper cited in Spelios’s press release enjoys “one big day” before spending the rest of its life “in obscurity or else go[ing] up in smoke.” It could also, in the hands of Picasso or Braque, end up in a collage. Our inability to hang onto a coherently readable image in the whirlwind of Spelios’s collages feels analogous to the irretrievable currents of spontaneous music. His fragments, the visual residue of a lost narrative, are recapitulated as pieces of broken time, frozen in mid-scramble. His artwork doesn’t back away from the hazards of obscurity; rather, it soaks up the potency of incomprehension and, in its electric collisions of light and shadow, makes its own kind of syncopated sense. 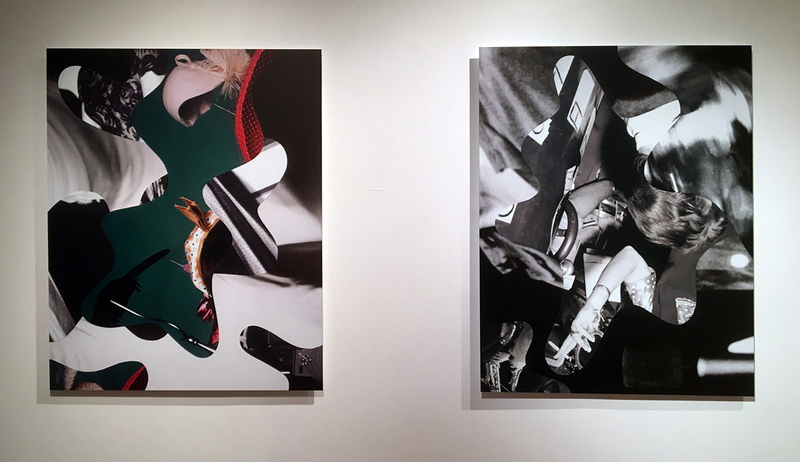 Tim Spelios: Before Disembarking continues at Studio 10 (56 Bogart Street, Bushwick, Brooklyn) through October 9.